love – Here there Be Dragons! That the dreams you dream in your most secret times and the deepest locked away pieces of your inner self are WORTH IT! They are worth fighting for. They are worth working hard for. They are worth your time, your attention, and your acknowledgement. What’s more is that YOU are worth it. Your happiness is worth it. Your time is worth it. Your dreams, hopes, and aspirations are all worth it. If only you will believe in yourself even half as much as I believe in you and you will be seizing the day, taking the world, moving all the mountains, and looking forward to new dreams by month’s end. You are more than able to do anything you wish to do. Whatever you please is within your grasp if you only look at things the right way and realize that you can close your fingers and hold on to it. And I…Well I am proud to say that I know you, because I am more than proud of you. So go, darling, Realize your Dreams. Reach Your Goals and climb up to the stars…I’ll be right here holding the ladder, supporting whatever you do, and basking in the glow of the night sky. The Top 5 Things that I love the MOST in my life! Without sounding too preachy here, there were a lot of times in my past that I felt alone, unwanted, useless, etc. My God helped me deal, carried me through, and brought me to where I am now. I will admit that I started out on this path scared senseless and it hasn’t gotten much better. I mean, raising a child ‘on my own’ (without a partner anyway) was a daunting, frightening, and sad thought. Now, I adore my Monkey and couldn’t imagine a life without her, or sometimes even with a partner. Someday I hope to find the man God wants us to have. Until then, she’s my one and only and I couldn’t be more blessed! I cannot begin to describe the amazing family that I’ve been given. My parents go above and beyond what even some of my friends’ parents would do. They are the embodiment of good role models and Christian teachers and having them here in our lives is amazing. My grandparents, both sets, are interesting and love my daughter to pieces and all of the aunts and uncles are completely amazing to us. We are surrounded by love, laughter, and light. For as long as I can remember, I have been telling stories. Characters, lines, themes, and settings swirl through my brain like food in a processor. Their voices and images interrupt everything I do and I am (usually) happy to oblige their insistence. Happily, I seem to have been blessed with a bit of talent to go with the drive. To be honest with you, I almost put nature(i.e. the BEACH) in this spot. I have very few friends at this point in my life and the ones I do still have are more family than anything else. However, I am blessed with some amazing people in my life. People that have been with my since early childhood, elementary school, high school, college, and now work friends. Though there are only three or less from each category that I speak to anymore, I know that I am loved, accepted, and put up with no matter what! That is at least as good as the ocean…Ok, it may be even better. What are your top 5 things? Is there another list you would like me to make? I can’t wait to hear from you! 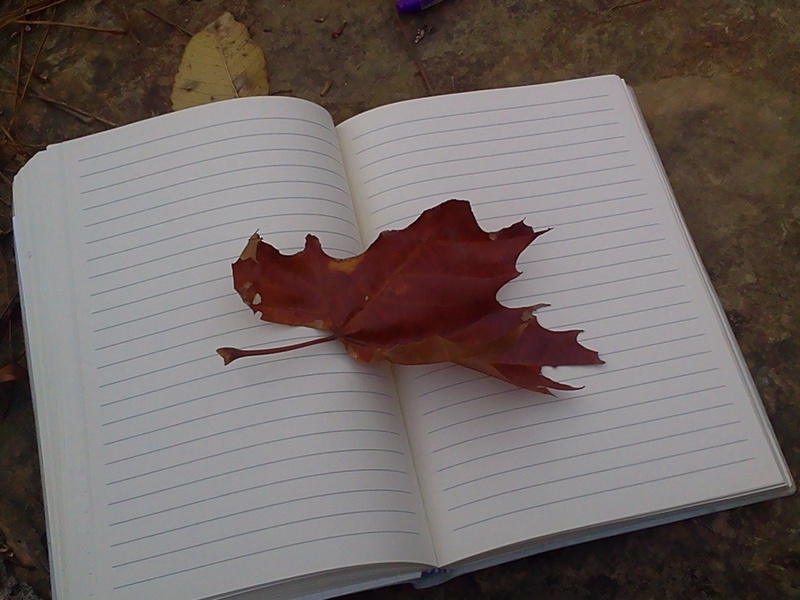 Things I love…A blank page, Nature, and the time to fill the two with my inner ramblings! Pray it out, Write it out, Cry it out, Cuss it out, and burn it all back together with chips, salsa, and action flicks. Now I want to know what your advice would be. Since the journal only allows for two or three small lines per answer, I want your response to be condensed into just a few short sentences. I hope none of you are currently dealing with this issue but…let me have it….How do You Cure a Broken Heart? I know that I am a mere character in someone’s book. I have suspected for some time now that I might be; all the signs point in that direction. No memories of my early life until, SUDDENLY, it appears…a perfect flashback. Mainly, though, I seem to cease for long periods of time. I just hang there, suspended in the middle of whatever activity was going on at the time. I once lay in the grass and looked at stars for 86 hours. How in the world do you explain that? No bathroom breaks, no conversations, no changing of the light and fading of the stars, and no movement of the earth on its axis: just me, laying in the itchy cold germ infested grass for 3 ½ days. That’s just not natural. One day, though, it ended. I was buffed and polished and given my own version of happily ever after…or as happily ever after as the best friend gets (seriously, she got the man of her dreams, a huge wedding, and a new castle-like home, I couldn’t even get a bridesmaid to look at me, the emotionally damaged best man). So I went on, living in the pool house, working a wonderful job, and they all lived… Until it started over. Dozens of ‘me’ are jotting around being read by random people. Sometimes a few pages and then shelved and started over days later by someone else, sometimes more, sometimes much less. I learned to survive with my own company, sometimes even being so lucky as to be suspended in time while with my friends so that we could at least converse and make faces at each other. But then, she arrived. The woman who would change my life and allow me to soar…the woman who bought my book. The second time she read the book she called her book club president to beg for a discussion on my story, the next month there were 8 women and 3 men who clutched their own shiny new copies of the book, 11 people sighing over the story and touting the characters; Alicia the most vocal. The last time she read my book, she had just broken up with a horrendously boring and sarcastic man. Alicia poured over the book, slowly reading any scene that I was in and crying in all the levels of sound possible. I wanted to reach out and wipe her tears, I was desperate to tuck her hair behind her ears, I stretched and pushed….I would be this close and then a page turn would happen. So I wished, and hoped, and tried, and prayed. Late that night, as she was finally snoring peacefully, I realized that the book had been left open beside her. I wasn’t in that part of the story, having gone away for the chapter, but I just KNEW that if I could there; well, I could get to her. I was right. It took most of the night and all of my concentration, but I finally felt a pop in the thin veil that keeps our worlds apart. It was like moving through Jello, but I made it just in time for Alicia to punch me out. When I came to, Alicia had me hog tied and covered by a police man…but she was more concerned that half of her book seemed to have been blanked out. That was all this morning, and I am now sitting in a tiny cell, in a tiny jail, waiting for my love. We’ll see how long it takes her to believe me. All because I fell in love with the woman who read my story, instead of my best friend’s. A good friend of mine shared this link with me earlier as an almost joking way to ‘find my muse’ for the Stone Dragon Saga stories. Well, the joke is on her because these little guys are AWESOME! I am not only inspired, I am excited AND there’s an Owl cam I can check out later on tonight! This is a great site to look at many types of videos, live camera feeds, snapshots, etc. Take a look, show the kids, pass it on to a teacher who may need some science/social studies clips. Have fun, crack a smile, saw ‘aww’, and share the joy! Have a Blessed Day!